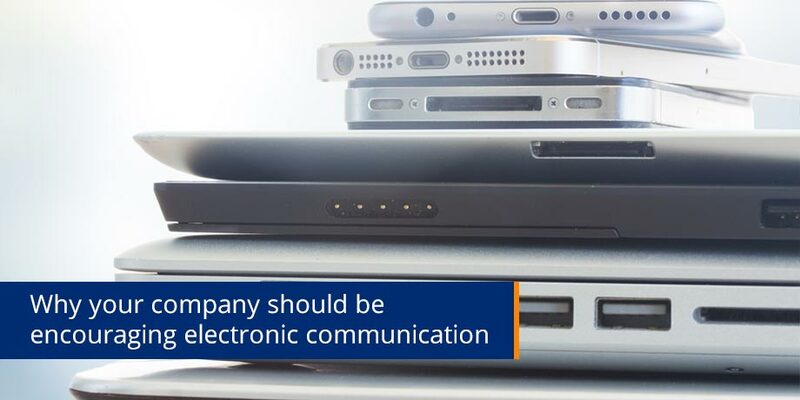 There are many compelling reasons why your company should be encouraging electronic communication with it’s customers, both business and consumer. It is often presumed however, that these advantages are self evident. In today’s Newsflash, I will detail the goals of any electronic communication strategy, as well as the opportunities and benefits of various applications. There are primarily 3 channels in which high volume electronic customer communication can take place: email, fax & mobile phone text messages (SMS). Your organization can easily and quickly change its current communication activities to take advantage of these mediums. Instant delivery and / or receipt: There are many instances where automating a message directly into a customer’s inbox or mobile phone is preferable; an ‘about to go due’ reminder, unplanned outage or other time sensitive notification. Email & mobile phone text messages are instant and very cost effective ways to achieve this. Reduced cost: Outbound email is between 60% and 95% less costly than regular mail, and 99% cheaper than an outbound call. Businesses should be striving to email first and paper mail only if unsuccessful. Improved process efficiencies: Quicker delivery, receipt tracking, reduced DSO etc, all contribute towards significant process automation efficiencies. Improved marketing capabilities: Due to the ‘push’ nature of email communication, marketing can be fully and automatically personalized to the recipient at almost no cost and with no limit to the number / library of offers that can be included. Consumer ‘take-up’ rates have proven to be many times more successful than bill stuffers or normal paper mail marketing. Automated data capturing: If form feedback / completion is required, this can be captured electronically, without the need for tedious data capture. It can also be instantly collated and automatically reported on. Improved cash flow / reduced DSO: Payment can be captured, securely & directly from within the email. As it takes only seconds to complete a payment in this manner, many recipients do so almost immediately upon receipt of the eBill /eStatement. We have seen in excess of 12 days average improvements in time to payment. Increased customer self-service & satisfaction: By giving your customers the option to reply to an email sent from your company, or electronically submit an application form, you are empowering them to easily and conveniently interact with you. Over 80% of all North Americans are using email every day, by allowing them to include their communication with you in this way, you are providing the most convenient channel possible. This will of course drive better customer service and satisfaction measures. It is important to have detailed reporting around all such communication activities, and ideally this reporting should be centralized and available for analysis. Having a single system to manage all your electronic communication activities is therefore advisable. It is also recommended to have such a system loosely coupled to your central customer database for ‘single view of customer activity’. Very few companies however, have achieved this to date and it is certainly something to strive for. Please do not hesitate to contact us for examples of such work with some of our largest customers, including: Mazda, Volvo, First National Bank, Avis, AAA, Barclays, Virgin Money & Vodafone.